When it comes to choosing a mouthwash, like toothpaste and toothbrushes, the number of choices are staggering and knowing where to begin can be difficult. Corsodyl (view here on Amazon) is one of the ‘bigger brand’ mouthwashes available, frequently advertised on television and in the press (particularly here in the UK). It is promoted to treat gum problems, which is a bigger problem within society than we may think. Corsodyl specifically targets bleeding gums, mouth ulcers and irritated gums. It can have positive effects on these, but there are some things to be aware of which means that you should not use this as a regular daily mouthwash product. Corsodyl is for targeted treatment programmes; read on to find out more in our Corsodyl mouthwash review, or for a more detailed comparison of options available, see our best mouthwash article. Yes, by all accounts it does. Having read countless reviews, articles and online discussion and taking all comments and results into context, the general consensus is that Corsodyl does what it suggests it will with many dentists actually recommending this as part of a treatment plan. This therefore means if you have sore, bleeding gums Corsodyl will help reduce and normally clear the cause of this. Not suffering from typical symptoms, nor wishing to encourage such for the sake of this review I am unable to make a personal confirmation of its effectiveness. The price of Corsodyl varies based on the size of bottle, the location and time when it is purchased. Depending on the seller from which you choose to purchase will depend on the deal available. I have found special offers along with bundle deals from a few of the major retailers including Boots, Tesco and Amazon. Corsodyl is available from most good drug stores or supermarkets including Tesco, Sainsbury’s, Superdrug and more. The variant on test in this review came from Amazon, available here, but you may also like to check out some of the other retailers below. If you are suffering from sore, swollen or bleeding gums or perhaps have one or more ulcers in the mouth, then this is a very good product for trying to reduce the impact and clearing the cause of the condition. It should be used as part of a short term treatment and not be used excessively, paying close attention to the associated risks. If your symptoms do not improve within 1-2 weeks, consult your dentist and refrain from using Corsodyl mouthwash for longer periods of time. Corsodyl Daily is an option for use over longer periods of time but it is advisable to speak to a dentist before using regularly. Whilst I cannot speak for you, I can speak personally in saying that I at times through my life have had sore, swollen or bleeding gums. For me instances of this have been where I have paid less attention to my oral health, when at the times I know I should have been. This included a few days of not cleaning teeth properly or just once a day, when I was particularly busy or stressed. You like me may have suffered similar instances, perhaps an ulcer or too. Why do they always feel bigger than they are?! In my particular case getting back on schedule with regular teeth cleans and flossing has solved the problem after just a few days. For yourself it might not be so easy. Corsodyl is designed to specifically treat and assist with similar circumstances and situations where the described is more severe. When the conditions are more severe it could be the start of gum disease. Gum disease or a more technical term periodontal disease, can lead to teeth falling out, which is highlighted in adverts for Corsodyl products. Periodontal disease is likely a bigger problem than many think. In 2010 it was advised that in America, the condition has likely been underestimated by some 50% and Chief Executive of the British Dental Health Foundation, Dr Nigel Cater suggests it could be a similar situation in the UK too. This animation (opens in a new window) shows how gum disease begins and evolves and the eventual result. Do not panic, this is the result if the problem goes untreated. Corsodyl looks to help in the earlier or even latter stages to help prevent the condition and ease pain in the wait to see a dentist or medical professional. The daily alcohol free option is another variant of the Corsodyl range that looks to protect and prevent rather treat and cure. Corsodyl mouthwash is effective because of the use of a particular ingredient chlorhexidine gluconate (CG for short). 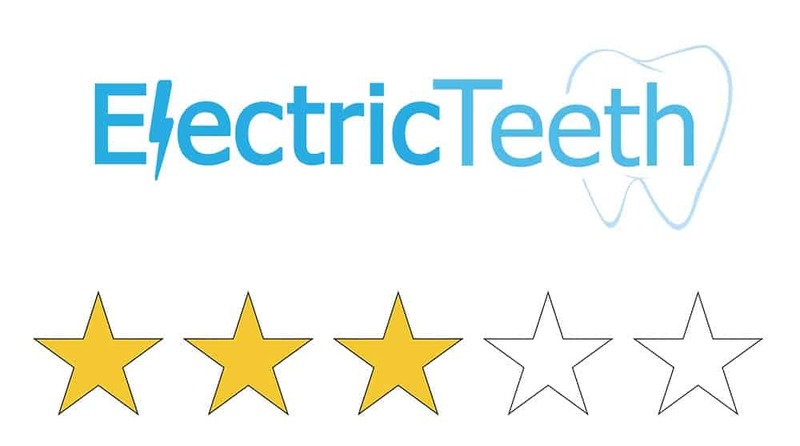 When testing any product here at Electric Teeth we do try to ensure that we use a relatively uniform approach and test products over a reasonable period of time to really understand, experience and find the pros and cons to using a product. With a mouthwash I would typically test over a period of 4 weeks, changing the time of the day I used it to see what effect this had. None of our tests are scientific but aimed to represent how you and others might use the product on a daily basis, in your everyday life. Corsodyl (the non ‘daily’ version) is slightly different and means that our more usual testing procedure cannot be followed. It looks to target gum problems and as I write this review and test the mouthwash I have no known gum problems, bleeding, soreness or ulcers, thus not making for an ideal candidate to test. I am not prepared to induce such conditions for the purpose of this review. Prior to any review extensive research is carried out and Corsodyl is a highly effective product which in reality is not advised as a daily mouthwash product for those with good oral health. Whilst it could be used, it is not advised and the stronger combination of ingredients and possible side effects has meant that for this review greater importance has been placed on independent user reviews from a variety of sources. I have tasted it and used it for a three days to see if I felt any benefits or effects from using such a product to aid the conclusions made. The directions for use were followed. each time I used the recommended 10ml dosage and taking into account the possible side effects. In line with this limited testing, my normal tooth brushing pattern remained, cleaning my teeth twice a day for 2 minutes with an Oral-B electric toothbrush, the Pro 6000 set to daily clean mode, with a CrossAction brush head. To note, the aforementioned Corsodyl Daily (not being reviewed here) can potentially be used as part of an everyday routine to prevent and protect as this has a different ingredient combination, but can still potentially have more aggressive side effects than some other products. Seeking a professional’s opinion is advised. Chlorhexidine gluconate or CG is an ingredient that has a very good success rate in treating active gum disease. According to Dr Nilesh Parmar CG actually sticks to your teeth, gums and tongue and inhibits bacteria. It opens up the cell walls of the bacteria and kills them. As it does it reduces the number of the bacteria in the mouth. With less bacteria comes less inflammation and less gum disease. It is present in other mouthwashes such as CB12 (reviewed here) but more abundant in Corsodyl products. You can also purchase CG mouthwashes from other brands here. You can find out more about chlorhexidine gluconate at Webmd and the BNF. The reason for paying particular attention to this is that the use of this has possible side effects, the biggest being possible staining of the teeth, but more on that in a moment. With such a targeted approach in what it tries to achieve, Corsodyl mouthwash should really only be used for short or prescribed periods. I have never seen a mouthwash that lists so many notices and possible side effects including staining of the teeth, tongue, possible burning sensation and peeling of the skin. Naturally, like any medical product you ingest there are the normal precautions that essentially explain that you could react to the mouthwash and stop using it in certain circumstances, but there are very clear notices about staining and burning that should be acknowledged. Now these are possible side effects and it can and will affect each user differently. Staining is perhaps the biggest cause for concern and there seems to be a mixed consensus that the staining does not come away with scale and polish from your dentist or hygienist. If the professional tools can’t remove this, it is a bit concerning. The staining of the tongue and burning sensations should stop after use. The directions do make it quite clear that you should avoid drinking tea, coffee or red wine (known to stain on their own) for a minimum of 1 hour after using Corsodyl. I suspect those suffering with staining most are those who have not followed these directions, but it can still be an issue. For those really suffering with oral hygiene issues the staining is a small possible side effect and the actual impact and effectiveness will generally outweigh this given the proven benefits of this liquid healer. Many, post dental treatment, use Corsodyl for a week or so to help ensure any wounds remain clean and healthy, ceasing use or choosing a different mouthwash once healed. Whilst not really advertised or made clear my advice and this too seems to be the general view of others, is that you should and can use Corsodyl, but do so either on recommendation and with direction from your dentist or oral healthcare professional, or if you are prescribing treatment yourself do not use for any more than a couple of weeks. If the problems do not go away or improve after this time, consult a dentist. In fact this is good practice anyhow, even if the issue appears to have been cured as a professionals opinion is extremely valuable and can highlight ongoing or possible future problems. It never hurts to get it checked out. If you are suffering from bleeding gums, ulcers, inflammation or some form of gum disease, regular brushing twice a day is an absolute must and the fundamental in beginning to treat such. Generally speaking, it is advised to use mouthwash some considerable time after brushing your teeth, as by using immediately after cleaning your teeth can wash away much of the benefit brought about by the toothpaste and the act of cleaning. Thus many, including the NHS advise using mouthwash at a different time. Directions on the bottle do suggest waiting a minimum of 10 minutes after brushing your teeth. The bottle comes in 300ml and 600ml options. There is a 500ml daily option. On test here is the larger 600ml bottle but this is large and probably too much for most use cases unless your dentist has prescribed longer use periods. 10ml is the suggested dosage and this is advised up to twice a day. Therefore a 300ml bottle will last 30 uses approximately which is 15 days, which is around the maximum time we would suggest using unless told otherwise. This 600ml bottle would last a month, whereas the 500ml bottle would last about 25 days. The cap of the bottles can be used as a cup for measuring and drinking the clear coloured mouthwash from. Inside it is a 10ml marker so you can measure fairly accurately, each serving. White in colour on the 300 and 600ml bottles the cap is textured around the sides to offer grip and should be large enough for most to hold and grip onto. Most mouthwashes have alcohol in them, with many coming in a alcohol free option too. This is no exception here with Corsodyl, offering a 300 and 600ml option of original and mint mouthwash with alcohol and a 300 and 500ml alcohol free variant with either cool mint, fresh mint or icy mint flavour options. With alcohol included in this 600ml bottle you might think this is the strongest and perhaps worst tasting option. Each user’s tastes and opinions are different. For me, I do not generally mind the stronger taste and find it refreshing in that you get the feel it is working with a normally strong freshness after use. The smell of the mouthwash is actually quite mild as was the taste to me in my usage. Directions follow the standard route of rinsing the mouth out for around 1 minute and spitting out when complete. It is after this time that the effects are felt. It left me with a rather unpleasant taste in the mouthfor 20-30 minutes and a slight burning sensation to the tongue. Whilst not enjoyable I could live with it and as weird as it may sound, I felt it was doing the job by leaving such an aftertaste. Priced typically at £3-5 for a smaller 300ml bottle and up to £10 for the larger 600ml the cost and its effectiveness is going to depend upon the price you paid. The 300ml bottle works out at about 16p per use when paying £5 or just 10p when paying £3 for the bottle. The 600ml actually works out more expensive or no cheaper than buying the 300ml bottle as I found it to be priced typically between £8-10. It is fractionally more expensive than most other everyday mouthwashes, but given that Corsodyl is specifically designed to target a particular set of issues, it is in my opinion good value. The 500ml alcohol free bottles look a bit more appealing than the others. Primarily a mix of a brown plastic bottle, white cap and minty green logo have a similar appeal to the aftertaste when using. However the bottle design is not what you should be too worried, it is the effectiveness and that it should have covered for most. I cannot speak first hand of just how well it actually works, for I do not have nor wish to replicate the effects of gum disease to test. But, having read hundreds of first hand opinions and listed to what others have had to say, including Dentists, it leaves me with no doubt that Corsodyl does work. It can ease soreness, inflammation, bleeding and act as a cleansing tool for open wounds as they heal. Conclusion, is Corsodyl any good? If minty fresh breath is the aim of the game for you, then Corsodyl mouthwash is not the route to go down. If easing pain and curing bleeding, soreness or irritation of the mouth is the desire, in the wait for medical attention, then this is where it comes into its own. Corsodyl is not the long term solution and should be used in short or prescribed periods due to the mentioned side effects. Use for the right reasons, following the right directions and you should be ok. Even if you teeth require a clean after use, you may have saved your teeth and gums from long term damage. Where can I buy Corsodyl? What are the ingredients in Corsodyl? No, not in the standard Corsodyl. Yes in the Corsodyl Daily option. Yes, up to 7%. There are alcohol free options containing just 0.2%. The mint flavour is quite mild and subtle on first taste, but there is a strong, often burning and not particularly pleasant aftertaste, which lasted about 30 minutes for me. There is theoretically no minimum or maximum number of times but generally it is advised twice a day. Do leave a minimum of 10 minutes, preferably longer after brushing the teeth before using the mouthwash. As I had no inflammation or open sores I am not the best to answer this, but research would suggest not. I did not feel any pain as such. The worst was a slight burning sensation to the tongue. Possible side effects are a rash or swelling to the mouth or face – stop using if this occurs. Soreness, irritation and swelling of the cheeks – Look to stop using if this occurs and speak to a dentist. These should go away after ceasing use. Temporary staining of the teeth and tongue, burning of the tongue and peeling of the skin inside the mouth. Depending on the bottle size you will typically get 15 days form a 300ml bottle and 30 from a 600ml. It may reduce the effects of such, but it is not designed to target this, with its primary focus being on killing harmful bacteria that can encourage gum disease. From what age can Corsodyl be first used? 12 years old is the advised youngest age to begin using. Yes, although this may reduce the effectiveness. The advised directions for use are to rinse and gargle in the mouth for 60 seconds spit out and do not swallow. How long will the mouthwash last once opened? As long as you keep the mouthwash in the conditions described on the pack, i.e. below 25°C, our Mint & Original mouthwash will last until the expiry date indicated on the pack label. 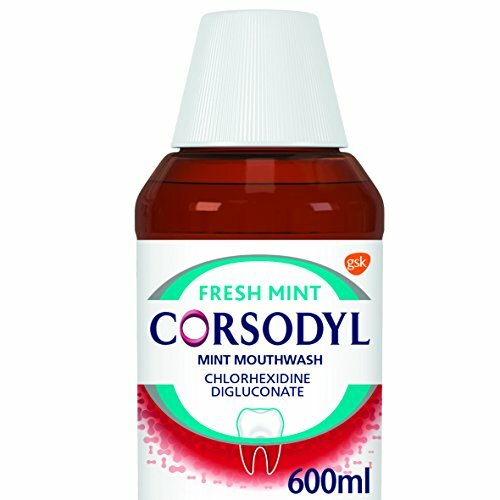 Corsodyl 0.2% Mouthwash (alcohol free) should be used within 3 months of opening. It is manufactured by Purna Pharmaceuticals but the Corsodyl name is a trademark own and manages by GlaxoSmithKline. Thank you for taking the time Jon, reading this has helped me decide what to do about my recurring teeth and gum issues and Corsodyl. Hi Tracey, thanks for the comment. Glad it has helped.